Function keys can be configured to customize the user’s phone keys. Key types are pre-defined and can be browsed through the Type drop-down list. The Supervision field allows the key to be supervised. A supervised key will light up when enabled. In most cases, a user cannot add multiple times exactly the same function key (example : two user function keys pointing to the same user). Adding the same function key multiple times can lead to undefined behavior and generally will delete one of the two function keys. SCCP device only supports type “Customized”. For User keys, start to key in the user name in destination, XiVO will try to complete with the corresponding user. If the forward unconditional function key is used with no destination the user will be prompted when the user presses the function key and the BLF will monitor ALL unconditional forward for this user. To enable online call recording, you must check the “Enable online call recording” box in the user form. When this option is activated, the user can press *3 during a conversation to start/stop online call recording. The recorded file will be available in the monitor directory of the Services ‣ IPBX ‣ Audio files menu. 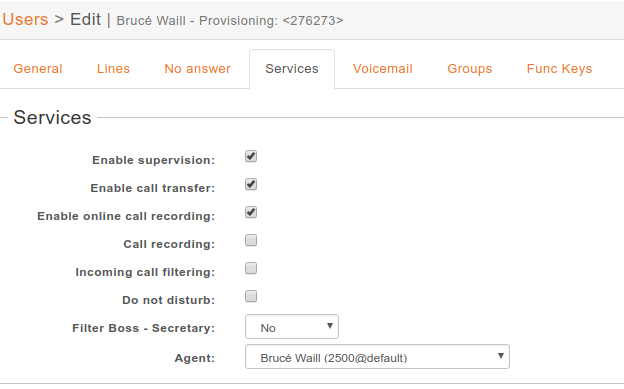 By checking the “Call recording” box of the user form. By using the extension *26 from your phone (the “call recording” option must be activated in Services ‣ IPBX ‣ Extensions). When this option is activated, all calls made to or made by the user will be recorded in the monitor directory of the Services ‣ IPBX ‣ Audio files menu. To test your microphone and speaker, you can call the echo test application. The application will echo everything what you speak. Dial the *55 number from your phone or application. You should hear “Hello World” followed by the “Echo” announcement. After the announcement, you will hear everything what you say. Using this application you may also get the latency between you and the server running the echo test.